Now available as a free placement with or without cash drawer receipt printer combo! 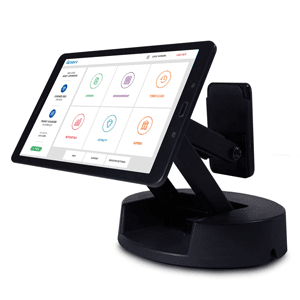 The Groovv Flex is designed for a merchant on the go with a detachable Samsung tablet and a companion payment device that is also able to be detached. With the small frame it can easily stow for traveling to shows or other events. Connect to the internet via your mobile hotspot or Wi-Fi network and run transactions. Our Groovv programs have been replaced with newer and better solutions. Complete the below form so that Chris can help you find a solution to best fit your needs.